Nobody trolls Donald Trump better than Pete Souza. Nobody. This awkward CNN screenshot of Chris Christie says everything about the Republicans’ shrinking future. Inside, a $35 ticket conference hosted by the New Jersey “School Choice” Education Reform Alliance (quote marks, mine). Inside, the man who’s made Camden his philanthropic playground, opened opportunities there for business friends to score, and put his name on a few some buildings – George Norcross, who also runs quite a few NJ Democrats. By him, a key beneficiary, Senate President Steve Sweeney, the Norcross operation’s presumptive pick for governor. Also there, NJ Education Commissioner David Hespe, appointed by Gov. 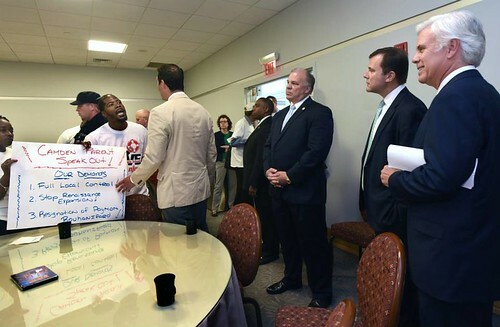 Christie to grease the way for privatization targeting NJ’s minority-majority cities. Outside, about 50 fed up Camden parents, who say they represent many more who aren’t available in the middle of a work day to crash a big wheelers’ get-together. These are Camden parents who are are tired of people who don’t live in Camden calling the shots about how their kids are schooled and excluding their input. They object to the way their children are turned into commodities for the privatizers of education. Camden’s only under state control two years and they already see the need to shake it off. And they want Christie-appointed Superintendent Paymon Rouhanifard gone. This imperfect snapshot of a perfect moment. 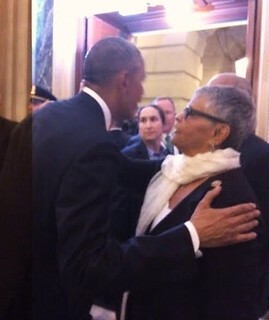 Rep. Bonnie Watson Coleman (D-NJ), sworn into office exactly two weeks ago, greeted by the President of the United States at the State of the Union. Not for nothing, but first black president and first black woman we ever sent to Congress from NJ. Thanks to BWC’s chief of staff James Gee for texting it just now. For what BWC had to say about tonight’s SOTU, jump to the jump page. 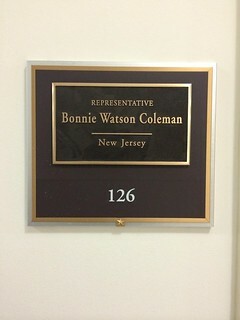 We expect to have inauguration info for Congresswoman-elect Bonnie Watson Coleman for you sometime tomorrow. Meanwhile, as her staff prepares for earliest-January swearing in, the name plaque’s just gone up outside the door at 126, Cannon House Office Building. This is Congresswoman-elect Bonnie Watson Coleman with her husband Rev. William Coleman, who is a former police officer in New York City. Just thought some of you’d like to see this. 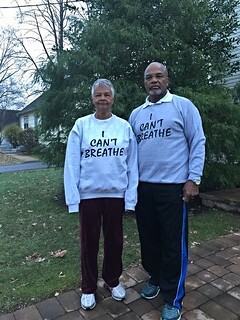 She posted this photo on Facebook a few minutes ago, with the note, All lives matter. We’ve had our differences with Star-Ledger editorial page editor Tom Moran. But this isn’t about that. We’ve sometimes excoriated the Ledger and sometimes lifted it up. It’s deserved both. But it’s not about that. We’ve bemoaned the celebritizing of politics, at the same time urging the jingle in your pocket should be spent on the live crinkle of the dead tree Ledger, as a statement of faith in the power of uncovering that it’s capable of. But this isn’t even about that, either. Damn it all, this is a sad photograph. 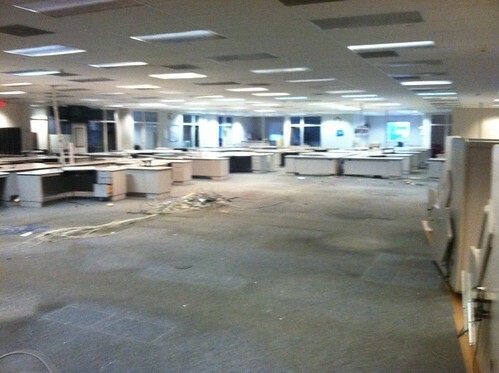 Star-ledger newsroom, where pulitzers were won, being dismantled. It’s Tax Day, so the message outside is about how Christie is misusing our money to advance his own political ambitions. The Mastro report. The October special election so Christie didn’t have to be on a ballot with Cory Booker. Commandeering the state police chopper to get to his kid’s baseball game or meet with Iowa GOP fundraisers. And of course, these “town halls” themselves, brazen GOP rallies dressed up as public events, with the cost passed on to you .